It’s hard to believe it’s been one year since the last E3 PlayStation conference. It’s become so foggy in my memory you could have told me it was longer and I wouldn’t have been altogether surprised. Alright, that’s a little unfair - last year PlayStation put on a show with a lot of spectacle (it snowed indoors for goodness sake) but I felt like it lacked a lot of substance due to an abundance of trailers with little explanation. I was glad, then, when Sony announced that it would be trying something different for E3 2018 by deep-diving into four of its biggest releases. Now that I’ve actually seen the show, however, I’m not so sure. There’s no denying that PlayStation had some extremely exciting games to show off this year but the odd pacing of the presentation detracted from them. In case you couldn't witness it for yourself, Sony's underwhelming show started in a small intimate space that was designed to look like a church. My first thought was that this was PlayStation’s attempt to create a more intimate feeling that would completely set it apart from all of the other grand E3 showcases. But then The Last of Us 2 trailer started and it became apparent that it was an attempt to immerse people into the scene of the game - a great idea on paper - except no one watching at home would actually be able to really appreciate that immersion. That lack of immersiveness for the home audience was an obvious issue, but it was merely the tip of the iceberg. As attendees were shuffled from room-to-room, viewers were treated to trailers and interviews that were unrelated to the game we just saw. That leads us to problem number two. After The Last of Us 2 trailer was shown and the presentation immediately went into an intermission, it was then that those at the event were shimmied into another room. This, I thought, would be a perfect opportunity to delve into what we just saw. This could've provided Sony an opportunity to elaborate on where game protagonist Ellie was in her life, what was happening in the clip, perhaps highlight some interesting new mechanics that we'd just seen. But no. Instead, the intermission was made up of a roundtable that felt uninformative and seemed to mostly serve as a vehicle to stall before the conference started again in a brand new room, this time clearly themed around Ghost of Tsushima. After the crowd was seated, we were treated to another lengthy bit of gameplay - which was a high point for the conference - but again it wasn’t followed up with much explanation. Instead of tasking the crowd to move yet again to another venue, Sony wisely decided enough was enough at this point and from then on out there were no more room changes. It’s almost like the organisers got really excited about immersion for The Last of Us 2 and Ghost of Tsushima and then balked at the idea of forcing its audience into a water and ink-logged womb for Death Stranding. 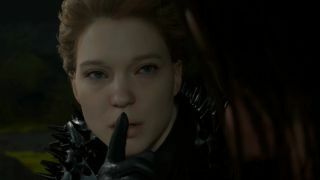 This decision was important as it (mercifully) meant the pace could pick up and suddenly we were getting to see reveals for Nioh 2 and Resident Evil 2 before we moved into gameplay from Death Stranding (which, by the way, could really have used a little more elaboration) in quick succession. Ultimately, PlayStation tried to improve on its format from last year but it didn’t quite change the right things. Sure, it showed fewer and longer trailers than last year and it was great to see some actual gameplay. But they were still just trailers and again we had the problem of PlayStation not really taking the time to explain a great deal more about what we were seeing. And it seems like such a shame that Dreams was tacked on at the end of the show ... if it was the end at all. It was hard to be sure and Sony did little to clarify just when the show had actually come to a close. Why does any of this matter? Because, in the end, this is bad for Sony - a company that had thus far been on a hot streak for conferences in the last three E3s. Case in point: Despite focusing on four of its biggest upcoming exclusives, we only have a sign of a release date for one of them. While the PlayStation presentation made a big effort to show us what comes next, it completely failed to tell us when we could expect it. As good as these games may look, having no indication of when we'll be able to play them makes it a little hard to feel any kind of truly immediate excitement. There’s no denying that with these four titles Sony still has the upper-hand when it comes to exclusives - the games we got to see were not only visually stunning, they were genuinely diverse in terms of story and setting - but Sony failed to deliver the key information any gamer would expect to hear at a keynote. I often feel that something that really helps Ubisoft press conferences is that they bring developers out on stage to explain their games and enthuse about what they’re working on. The enthusiasm is infectious and it’s the kind of opportunity that only really comes around during events like E3. Judging from the gameplay we witnessed during the PlayStation conference, Sony has incredibly talented and passionate people working on its games. In a show that was intending to take an in-depth look at just four titles, it would have perhaps been a nice touch to bring in some more developer insight and passion into the show. It’s really a testament to how great these games have the potential to be that they made the conference look good and not the other way around. Sony has said it will be livestreaming over the next two days of E3 so more information is perhaps forthcoming, but I can't help but feel that this conference could have packed a little more punch if it wasn't spread so thin.